This modern marble podium is an attention-grabbing combination of traditional design and contemporary lightweight construction materials. Each full size lectern stands 49" tall and features a sturdy black finish aluminum frame with MDF base, top, and shelf. 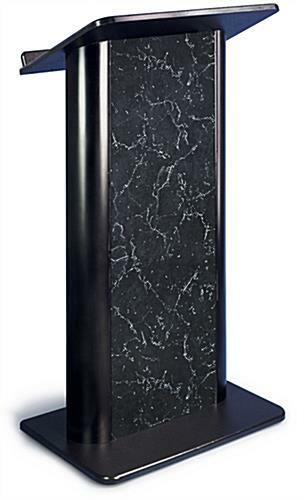 The Pyrenese black marble podium's decorative front panel mimics the look of expensive natural materials and brings a classic element into any conference room, church, or facility decor. This sturdy floor standing pulpit includes a slanted top surface with book-stop to hold reading materials in place, and an internal shelf for accessories and supplies. This black aluminum and marble podium's elegant look complements any environment, making this stylish fixture an ideal choice for use as a modern church pulpit, facility or conference room fixture, or as boardroom or meeting presentation furniture. Each full size freestanding speaker's stand is designed to command the attention of audiences in business, organizational, event, and educational facilities.